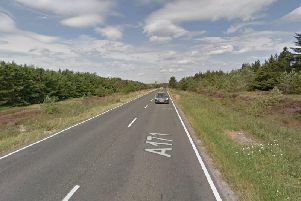 A 73-year-old female has been taken to hospital after a fall on the North York Moors. The woman had fallen and sustained a shoulder/arm injury walking on the North York Moors above Littlebeck. The Scarborough and Ryedale Mountain Rescue Team were called by North Yorkshire Police at around 10.19am this morning. 11 members of the Scarborough and Ryedale Mountain Rescue Team were deployed to the scene. A spokesperson from the Scarborough and Ryedale Mountain Rescue Team said: "After administering pain relief evacuated the lady in one of our Land Rover Ambulances to Littlebeck where we transferred her to a Yorkshire Ambulance Service crew for transportation to definitive medical care.